Purple Essentials is very excited to announce that a date for the opening of our new studio at 663 Beach Road, Unit 101 in Qualicum Beach, BC will soon be announced! While the Grand Opening will take place in early 2017, a Christmas Shopping Event is being planned for early December - watch for more details to be advertised soon. For all of our current, Purple clients ... online sales have resumed for Christmas shopping. While only select items are currently available, we are busy in the kitchen working on fresh batches of all your favourites! Tips for Having Healthy Winter Skin, Naturally! Exfoliate, Face: There is a fresh-faced glow hiding under that layer of dull, dead skin cells. The best way to uncover it is to exfoliate (gently remove the dead skin cells - 2-3 times per week, depending on skin type). For the healthiest glow it is best to use a product that contains spherical/round beads (ie. cornmeal, jojoba beads...) vs. sharp, jagged granules (ie. apricot, walnut shell...) that can scratch and inflict microscopic tears to the skin. Moisturize, Face: You can add moisture to your skin from the inside and out, by drinking plenty of clean water (avoid caffeine and alcohol as they create dehydrating effects in the skin and body) and applying a high quality moisturizer to facial area, neck and chest, while skin is still damp from cleansing (morning and bedtime). This will help your skin to absorb and lock in the moisturizing nutrients it needs to stay soft and supple. Temperature: Avoid dehydrating, dry heat by turning down your thermostat at home and on the hot water heater. Add a humidifyer to your bedroom. Use lukewarm water to cleanse your face and turn down the hot water in your bath and shower, as high temperature water can wear down and defeat skin's protective layer, which can increase inflammation and accelerate skin's ageing process (yikes). Cleanse with a moisturizing soap or bath & shower gel (SLS free). Exfoliate with a body scrub or polish, to release dead, dry skin cells that can cause the irritating dry-itch we often experience through the Winter months. Moisturize, in the bath or shower by using a bath & massage oil (plant based oils vs. mineral oil), apply a thin layer of oil while in the bath or shower, after cleansing...just before you are ready to turn off the water and head for your towel. Massage it over skin, rinse and pat dry. This will add moisture to your skin and can often allow you to skip the body moisturizing step that is dreaded on the freezing cold days. If you skip the bath & massage oil or just need a little extra moisture for your skin, use a body moisturizing cream or lotion, daily and as needed. Apply while skin is still damp for the most effective and long lasting results. Also, be sure to avoid lotions and creams with alcohol listed as being one of the first few (or any) ingredients. The alcohol actually evaporates the product from the skin (to leave a non-greasy feeling), which contributes to dry skin and multiple applications of the product throughout the day. A nourishing body cream or lotion made with cold pressed botanical oils may take a little time to sink into your skin, but it will also nourish and moisturize your skin for an extended period of time. (this can be a healthy step as well as saving you money in the long run). Purple Essentials skin nourishing products that can help you to keep your skin healthy, soft and supple throughout the year and its skin changing seasons. Cleansing, Face - Orange & Rosemary Facial Cleanser. Exfoliating, Face - Cleansing Grains. Exfoliating, Body - Scrubs & Body Polishes, Vanilla Tangerine Body Scrub, Ginger & Mint Body Scrub. Whipped Cocoa Body Polish, Whipped Sugar Body Polish. 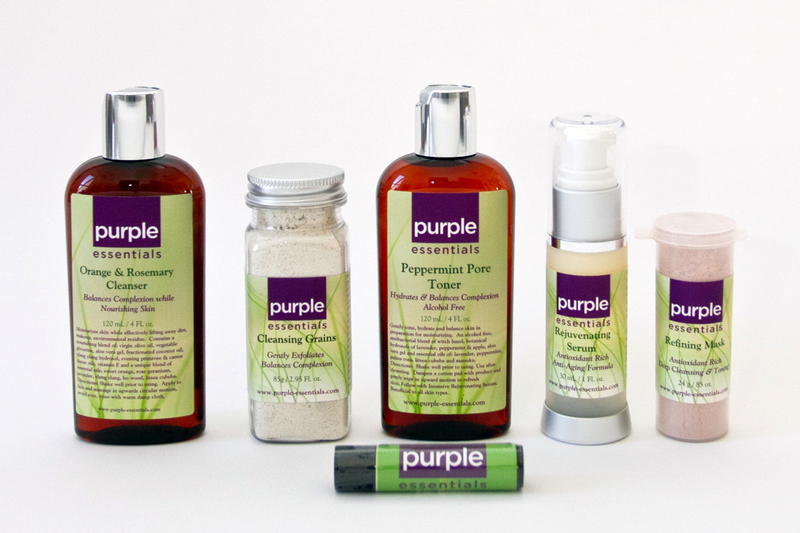 Purple Essentials Helps Protect and Nourish for Healthy Winter Skin! !